On 2nd May 2007 together with my friends André and Mark I visited a theatre show of the Dutch a-capella quartet Rock4. This turned out to be a surprising event with 4 very talented guys with true professional voices. The set before the break contained a series of Queen songs such as It's A Beautiful Day, Killer Queen, Good Old Fashioned Loverboy and Somebody To Love. This last song was a real amazing treat because they had turned it into a blues song. Very moving to hear such a new interpretation. 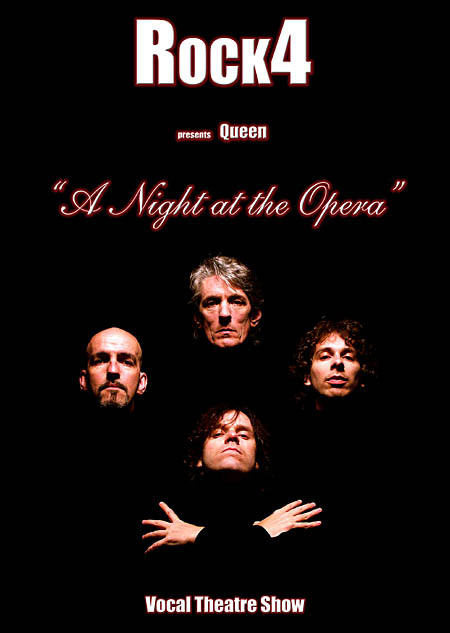 (the audience was divided into 3 groups and we all had to sing "Find me... somebody to love"
The second part of the show was a performance of the complete A Night At The Opera album. One would think this just could not be done, only by 4 voices, but they succeeded in an overwhelming way. It was a great evening, the show lasted for two hours.